As Bengaluru prepares for the Lok Sabha polls less than three weeks away, the police have launched yet another drive to “document” residents living in apartment complexes across the city. 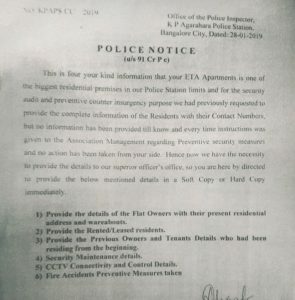 As per directions sent out by Bengaluru City Police (BCP), apartment owners’ associations have been asked to provide full details of their residents and safety and surveillance assets, as part of the police’s ‘Preventive Security Measures’. the ‘Safe Bangalore’ scheme. The only difference between then and now is that unlike in 2008, this time there is no threat of “action” against those not furnishing details. However, in places like Delhi, Goa, Punjab and Chandigarh, police have filed FIRs against landlords under Section 188 of the IPC (Disobedience of order duly promulgated by public servant) for failing to furnish details for police verification. Under the Karnataka Police Act, 1963, state police officials are empowered to obtain tenant verification details from landlords, paying guest houses, service apartments, guest houses, and other such businesses. One reason for this is to enable police to keep tabs on foreign students residing in the city. Bengaluru has approximately 19 lakh properties, including vacant lands, mapped under Bruhat Bengaluru Mahanagara Palike’s (BBMP) GIS Enabled Property Tax Information System (GEPTIS). However, the criteria for categorising such property as used for self-occupation and for rental purposes remain unclear. The blanket nature of the information asked for in the latest police “directive” has raised eyebrows. “While police engagement and interaction with the public is appreciated, there is lack of clarity on what purpose such information would serve,” said activist Meera M.
“We agree that background checks are needed prior to any transaction. But people have privacy concerns about their personal data being in the public domain and the potential for its misuse,” added Meera, echoing the sentiments of residents who have received the police directive. 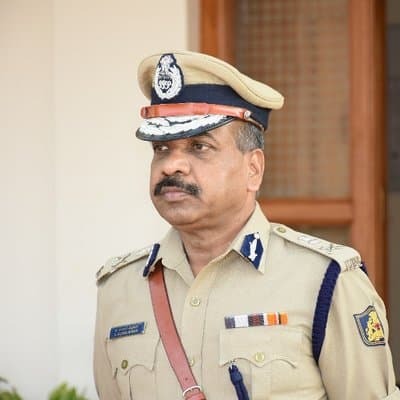 Police Commissioner T Suneel Kumar, in an attempt to quell any controversy, said the data collection was only to ensure residences were given to genuine tenants. “What if those with criminal background or with intent to commit untoward acts reside amidst law-abiding people?” asked Kumar. Kumar added that the police intended to curb overstaying by foreign nationals, as “some of them with expired visas are engaging in criminal activity”. “We would be glad to share the information required, if the police could explain why they are collecting the data and what steps they will take to safeguard it,” said Anupama Kilaru, a member of Whitefield Rising who leads the neighbourhood watch programme. “I do believe the police wants to make sure anti-social elements do not harm residents.” It is important to keep in mind that Bangalore, being the country’s IT capital, attracts talent from India and abroad, and the police needs to be alert, added Anupama. “But they should use all communication channels to reach out to citizen groups, and take their support in safeguarding national interests and in securing neighbourhoods,” she said. 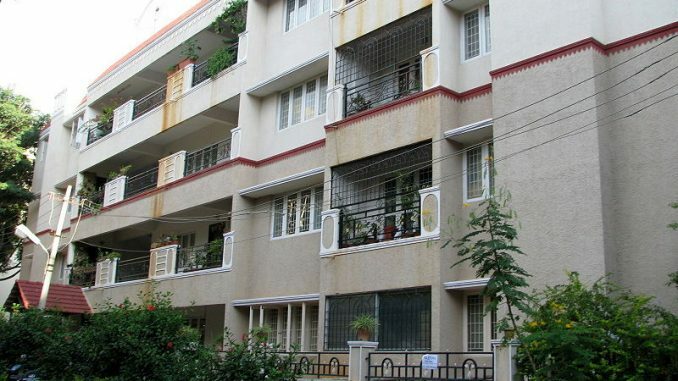 Srikanth Narasimhan, General Secretary of Bangalore Apartments’ Federation (BAF), however argued that apartment associations neither have an obligation nor the authority to share tenant or owner information with anybody else. Citing recent court rulings in the Aadhaar case, he said citizens had the right to privacy. “When an owner rents out his/her apartment, the owner and the tenant enter into a private contract. It will be illegal for apartment associations to share these details with anyone else,” said Narasimhan. “If they do, the association and its managing committee members can face legal repercussions. Hence, if such data is needed, police must ask individuals to furnish it and cannot direct apartment associations to do the same”. On the legality of such data collection, advocate G V Ashok said, “The authority to collect data must be through the strength of law, which together with the specific data collection exercise, be fair, reasonable and non-arbitrary.” The current police directive cites Section 91 of the CrPC which gives the police power to collect information, but does not address concerns like security of the data collected, the length of time for which such data can be stored, and penalties for leak of data, added Ashok. This may be sufficient ground for people to move the High Court, challenging the data collection drive, he said. “The question of whether the exercise is fair, reasonable and non-arbitrary is not fully answered either in the police notice or in section 91 of the CRPC itself. But people cannot simply sit back and refuse to comply with the police order either,” said Ashok. For long now, residential complexes are managing their own water sources, despite BWSSB’s promise to supply water. The second and final article in the series takes the lid of a festering issue between tanker water suppliers and apartment managements: pricing. We were thrilled to find a sprawling mini-forest near our our new home, with the blue sky looking down on it. The happiness was shortlived. Mixing fitness, fun and charity more than a thousand people participated in the women’s day run. Nevertheless public support is always needed for identifying the bad elements and weed them out. Every citizen is a police official without uniform and every Police official is a citizen in uniform. Sir, please make the application online who ever likes to furnish the details he will do it instead of using hard copy. Without money your police team will never do anything, so avoid corruption.